Carlisle United secured their League Two status with victory over play-off chasing Plymouth Argyle. The visitors twice tested Mark Gillespie early on with rasping drives from Anthony O'Connor and Bobby Reid. 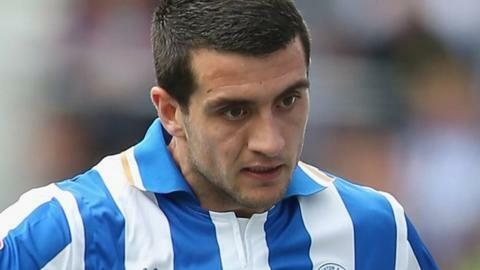 The Cumbrians took the lead when Gary Dicker volleyed past Luke McCormick from 25 yards out. The lead was doubled just after the break when Kyle Dempsey fed Billy Paynter, who slid a low shot into the left corner. The win guarantees Carlisle's survival as they moved nine points clear of the relegation zone with only two games remaining. Plymouth remain in sixth but are now only in the play-off places on goal difference after Luton's 3-0 win over Hartlepool. Match ends, Carlisle United 2, Plymouth Argyle 0. Second Half ends, Carlisle United 2, Plymouth Argyle 0. Attempt missed. Peter Hartley (Plymouth Argyle) left footed shot from outside the box misses to the right. Corner, Plymouth Argyle. Conceded by Brad Potts. Tareiq Holmes-Dennis (Plymouth Argyle) wins a free kick on the left wing. Attempt blocked. Tareiq Holmes-Dennis (Plymouth Argyle) right footed shot from the left side of the box is blocked. Billy Paynter (Carlisle United) wins a free kick in the defensive half. Foul by Zak Ansah (Plymouth Argyle). Attempt missed. Brad Potts (Carlisle United) left footed shot from the centre of the box misses to the right. Attempt saved. Billy Paynter (Carlisle United) right footed shot from the left side of the six yard box is saved in the bottom left corner. Corner, Carlisle United. Conceded by Curtis Nelson. Attempt missed. Anthony O'Connor (Plymouth Argyle) header from the centre of the box misses to the right. Corner, Plymouth Argyle. Conceded by Patrick Brough. Dominic Blizzard (Plymouth Argyle) wins a free kick in the defensive half. Zak Ansah (Plymouth Argyle) wins a free kick in the defensive half. Substitution, Carlisle United. Paul Corry replaces Gary Dicker. Attempt missed. Brad Potts (Carlisle United) right footed shot from outside the box misses to the right. Attempt saved. Billy Paynter (Carlisle United) header from a difficult angle on the left is saved in the centre of the goal. Corner, Carlisle United. Conceded by Tareiq Holmes-Dennis. Tareiq Holmes-Dennis (Plymouth Argyle) wins a free kick on the right wing. Billy Paynter (Carlisle United) wins a free kick on the left wing. Foul by Dominic Blizzard (Plymouth Argyle). Corner, Plymouth Argyle. Conceded by Danny Grainger. Substitution, Plymouth Argyle. Lee Cox replaces Gethin Jones. Substitution, Plymouth Argyle. Ryan Brunt replaces Carl McHugh. Substitution, Plymouth Argyle. Zak Ansah replaces Reuben Reid. Corner, Carlisle United. Conceded by Gethin Jones. Attempt saved. Kyle Dempsey (Carlisle United) right footed shot from the centre of the box is saved in the centre of the goal. Reuben Reid (Plymouth Argyle) is shown the yellow card. Lewis Alessandra (Plymouth Argyle) wins a free kick in the attacking half. Goal! Carlisle United 2, Plymouth Argyle 0. Billy Paynter (Carlisle United) right footed shot from the centre of the box to the bottom left corner. Assisted by Kyle Dempsey.